This atmospheric painting is one of very few works in the United Kingdom by the renowned seventeenth-century French artist Georges de La Tour. At the time of acquisition it was described as 'St Jerome with spectacles of the manner of Albert Durer', but the identification of the figure was then forgotten. Similarly, the painting was not ascribed to La Tour until 1939, when his oeuvre was beginning to be established. There are only a limited number of signed or dated pictures by La Tour, whose stylistic development remains unclear. In spite of some surface wear in the figure of St Jerome, the less damaged areas - such as the shadowy folds of paper and wrinkled forehead - contain passages of such brilliant quality that his authorship cannot be doubted. La Tour's work is distinctive in both style and subject. He is most celebrated for his mysterious candle-lit compositions. His art reveals knowledge of Caravaggio, particularly in the use of chiaroscuro, although this may have been gleaned through the works of that artist's Northern followers. Here the source of light is outside the composition and is used to intensify the luminous red clothing and to render the paper almost transparent. This painting demonstrates La Tour's characteristic sensitivity to the texture of human hair and skin and his ability to endow the humblest figure with religious authority. 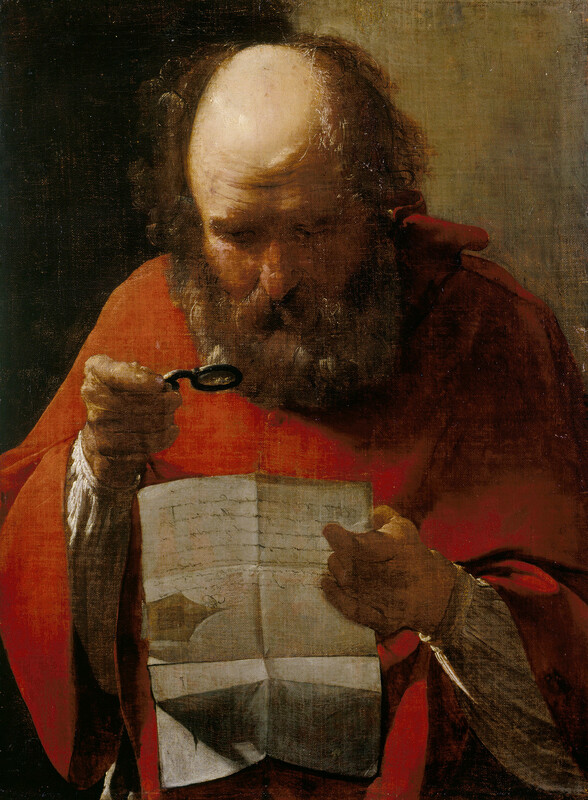 His love of genre detail is demonstrated in the spectacles, which give the aged saint an air of added concentration. This is not a typical representation of St Jerome, who wrote the Latin Vulgate translation of the Bible. His prominent red robes signify his traditional role as the first cardinal, but the other more usual attributes, such as a skull or cardinal's hat, are omitted. Until recently, the present canvas support was adhered to a branded oak panel. This technique, known as marouflage, was used in Antwerp workshops in the middle of the seventeenth century; it is probable that the painting was sold to Charles II in that state.